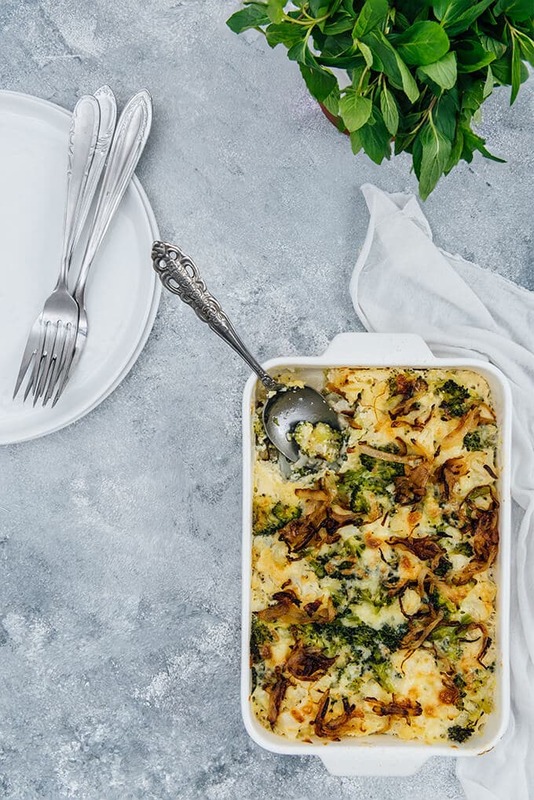 This Broccoli Cauliflower Casserole is a wonderful side dish that you can easily make for special occasions. It is gluten-free and low-carb, yet unbelievably tasty. I didn’t have enough cauliflower on the day I made this casserole, so I decided to combine it with broccoli. They are from the same family, aren’t they? I was keeping that broccoli to try the Sriracha Honey Roasted Broccoli recipe I saw on Barefeet In The Kitchen. Will definitely try it later. I wanted this casserole to be really healthy and low-calorie, so I didn’t load it with cheese, just ½ cup was enough. If you like it more cheesy, you can increase the amount of cheese. It’s definitely up to you. Besides, this is a gluten-free broccoli cauliflower casserole recipe. No flour or no substitute for it is needed. Instead I added a combination of yogurt and milk in the egg mixture. This helps everything hold together, so you can slice it when serving. The recipe is quite simple. Steam or cook cauliflower and broccoli florets for 5-6 minutes, transfer them into cold water and drain. Meanwhile, whisk together an egg, milk, Greek yogurt, olive oil and cheese. Add in the cooked broccoli and cauliflower florets and bake for about 40 minutes. Optionally, you can sprinkle little cheese over it and bake an extra 5 minutes or until slightly golden. I know most of our readers are big fan of Skinny Green Bean Casserole, but believe me this one is as tasty. Tell you what? I was inspired by the onion topping of a classic green bean casserole and top this casserole with some golden onions after it is baked. Believe it or not, this final touch makes a big difference, so don’t skip it! 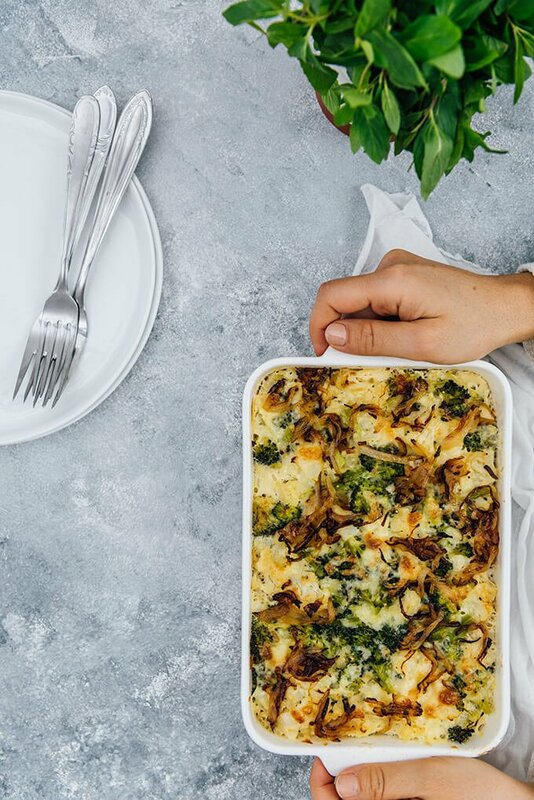 In addition to all of these, this broccoli cauliflower casserole freezes well, so you can prepare it ahead of time and bake when you are in need of a tasty side dish to serve at a family dinner occasion. Why don’t you try it for the upcoming Thanksgiving? A gluten-free and low-calorie side dish recipe with cauliflower and broccoli. Simple, easy, healthy, yet so tasty.